Inder Loves Folk Art: Pinafore. You know how I said I wasn't going to sew more for Maggie until she grew a little bit? You didn't believe that for a second, did you? Smart readers. Oh my sweet, starry eyed Margaret Joy. I love you so. Naturally, I can't resist making you nice things. It's no secret that I have a deep, nostalgic love for the styles and cuts that my mother and grandmother sewed for me when I was a child. Pretty little gathered dresses. Smocking. Flared pants and peasant tops. Overalls. Lots of eyelet trim. Seeing those styles - it's like coming home for me. 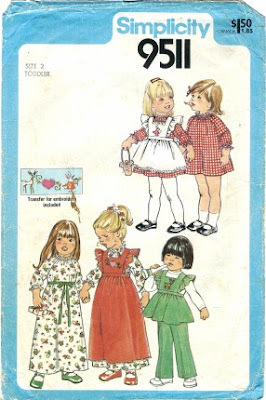 One of my favorite late night activities is browsing"vintage" children's patterns from the 1970s and early 1980s on Etsy. I picked up this little beauty in a toddler size one a short while ago - I was on a quest for the perfect peasant top/dress at the time, but the idea of a pinafore/apron top really started to grow on me when I saw the pattern. This weekend, I didn't have any projects currently in the works, although I had a lot of possible projects brewing in my head. When this happens, I thumb through my patterns and my stash and wait for inspiration to strike. 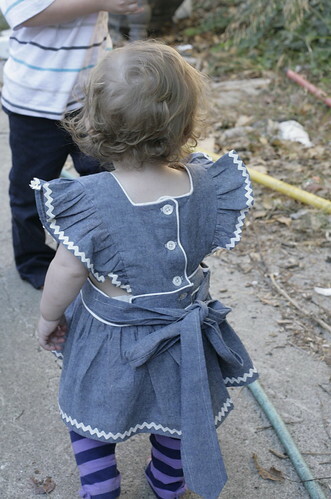 On Saturday, the pinafore called out to me, and told me that it could be fresh and pretty in simple blue and white. Before you write me off as crazy, remember what Michelangelo said: “Every block of stone has a statue inside it and it is the task of the sculptor to discover it.” Well, that's pretty much how I feel about fabric. I wait for it to tell me what it wants to be. Okay, yeah, I might be a little bit crazy. I cut out both the dress and the pinafore, but the pinafore was all I was able to complete this weekend. I spent quite a bit of time fiddling with the embellishment. I briefly considered embroidery, but rejected it due to time constraints. So then I spent a lot of time experimenting with rick-rack. My first version had rick rack on the bib and the sleeves and the hem and ... it just seemed a bit goofy. It turns out it is possible to have too much rick-rack? Who knew? Let's face it, pinafores are a somewhat anachronistic garment these days, and while the idea of a pinafore or overdress has deeply practical roots (to protect an underdress and add a layer of warmth), to modern eyes a ruffly pinafore easily appears a bit twee or frou-frou, like something your mother plans to photograph you in and then blackmail you with later. So I ended up removing the rick-rack from the bib and then ripping the halfway sewn garment apart to insert piping. A lined bodice always looks so nice with piping. And once you've piped the neckline, you have to pipe the waistband too, right? Most importantly, I have yet to see a garment that has too much piping. (If you've seen a garment with too much piping, I want to see it! Of course, I would probably think it's fantastic.) This meant that I spent a lot of time with my seam ripper on this one, and basically sewed the garment twice. But oh. 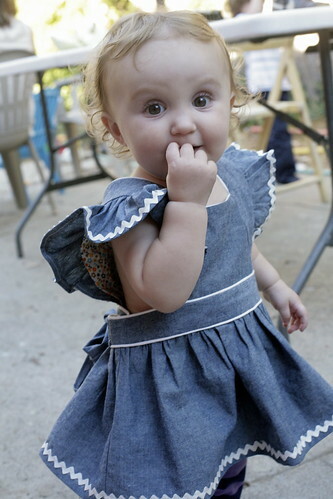 It was worth the trouble, because the piping makes this dress. The moral of this story: When in doubt, pipe everything. And it's easier if you plan to do this from the get-go, rather than changing your mind halfway through construction. You can see in this photo that I lined the bodice with a cute little floral, which I am also planning to use for the little dress. I find it rather lovely that in chambray, with white piping and white rick-rack, this pinafore actually reads 1940s and doesn't look 70s at all. With a shape this classic, fabric choices are everything. The final product is still a bit twee, and definitely retro, but not (I hope) completely over the top and blackmail worthy (don't worry, I have plenty of photos to blackmail my kids with, I consider it a sacred part of my parental duties to capture such moments on camera). It turned out a little bit large. To be fair, Maggie measures a bit small for the size one, so I expected there would be room to grow. It seems that even vintage Big 4 patterns run a little large. Since this is a loose style, cinched in in the back, she may be able to wear it as a pinafore all winter and as a top next summer. It is not perfect, of course. Most of the little "issues" are in the back, where, after ripping everything apart and resewing it, you can see that things did not quite line up horizontally, resulting in a little buckling and rippling. Luckily, a big sash can cover a multitude of problems. 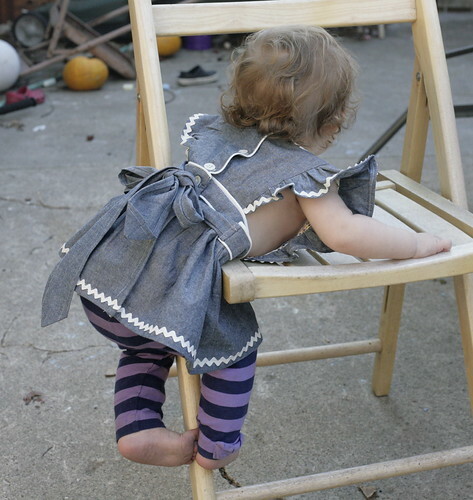 I only made one change from the pattern, which was to make the dress apron-style - fully open in the back. The pattern calls for the skirt to be sewn up to within an inch or so of the waistband, with the waistband overlapping. This would require putting the pinafore on over the head, and it's hard enough to wrangle a toddler into clothing, so I opted to leave it open in the back. There isn't much cuter in this world than baby chub peeking out from under a cute summer top. The peasant dress should be a much simpler, faster sew, and it's all cut out and ready to go! Super cute!!! I'll agree about no such thing as too much piping ; ) Awesome job! There is no such thing as too much piping!! :-) Hey Andrea!! I miss you, lady! Hope you're doing well! Oh Inder, she is adorable. I have a HUGE collection of vintage patterns, please let me know if you are after something special. I am happy to share. I get a lot from eBay. Ooooooh! That is a very appealing offer, Nicole! And too sweet! It's too bad the international shipping is so much - I would feel bad taking you up on it. My auntie also promised me a pile of her patterns, which she actually sewed for her kids in the 70s, so I think I'm good for now, but I will let you know! It is perfect! I think there's still a bit of 70s vibe, but only in the best possible way. Oh yes! You know you don't have to say "only in the best possible way" because I love 70s styles. Except the polyester. I'm more a natural fibers girl. But the shapes and cuts are the best. I never believed you! How could you resist sewing for such a cutie? Indeed - we would be negligent not to! I absolutely LOVE this Inder!! wow, inder, there is something about that top photo that is particularly heart melting. and all of your piping! i am so impressed! the rick rack really is the perfect complement! and i adore those striped leggings! I remember seeing this on Flickr but I guess I never commented here. Obviously, I love this. And the piping does make it! I found that it was big as well, around the waist. And I think I'll increase the width of the band to create more coverage on the sides. Does it still fit her? Piping that pinny is huge amount of work, it is gorgeous.